HILLSIDE, NJ, USA―A new SGV Vortex Pump Head for Vanton SUMP-GARD® vertical thermoplastic pumps handles fluids and slurries containing stringy materials or solids to 2 in. (51 mm) in diameter. Solid thermoplastic construction of all wetted components allows corrosion-free, abrasion-resistant handling of acids, caustics and a wide range of solids-laden wastes at temperatures to 275°F (135°C). The SGV Vortex Pump Head features a recessed, dynamically balanced, clog-free impeller, allowing solids to pass through the pump without blockage, and is offered on Vanton SG Series sump pumps for depths to 20 ft (6.1 m), and SGK cantilevered bearingless run-dry pumps for depths to 4 ft (1.2 m). 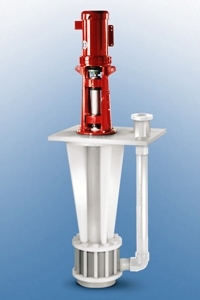 All fluid-contact components of the pump are available in abrasion-resistant polypropylene (PP), polyvinyl chloride (PVC), chlorinated polyvinyl chloride (CPVC) or polyvinylidene fluoride (PVDF), which are chemically inert to the corrosive fluids they are specified to handle, unlike metallic components. The heavy-duty stainless steel shaft is fully isolated from the fluid by a thick-sectioned thermoplastic sleeve, eliminating metal contact with the pumped fluid.